For a while, the initial few pages would take your mind back to The Velveteen Rabbit. The book starts out with a lingering feel of the children's classic, and magical journey of its own. Jerry Pinto's first book for children is an entertaining one for adults and young teenagers. the main protagonist of this story is a bear: Thurston Gustavus Buckridge III, an inherited treasure for young Felicia. The bear shares his space rather happily with other quirky-named toys, including a mouse named Thunderbox Permusin Peterkar. The twist in the tale happens when Felicia father finds out that the bear is an antique treasure worth a lot of money and vows to sell him off. The usual adventures follow with a happy ending. 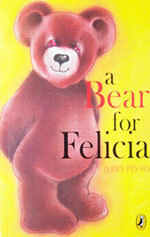 The book charms one over when it comes to the character of the bear and Felicia. The latter, a precocious little kid who spends most of her time dreaming of a different name for everyone is etched well enough to be believable. The bear meanwhile is the wise, all-perceiving toy, a voice the writer uses well to put some basic themes across even as the stuffed toy goes about admonishing himself for lecturing you. It's quirky, cute and immensely charming.